They have a spring and no visible threads or circlips. How do I get them off in a manner that would allow replacements to be installed? Here in the states we sometimes call them cotter pins. 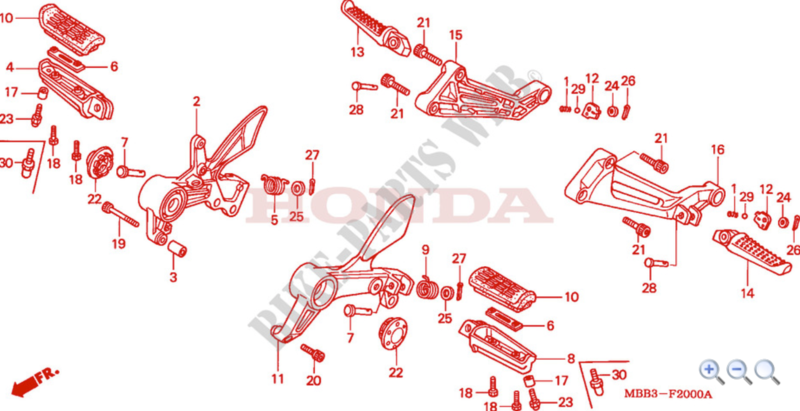 - Can I "just" take off the shifter at the axis, replace the footpeg, and replace the shifter? - Or do I need to factor any kind of gear calibration-type stuff into that? - When replacing the shifter, do I need to be careful with the torque value? I have a torque wrench, but if it's served by loctite and "hand-tight" then that's fine with me. - Once I've got the footpeg replaced and I am putting the main pin back in, is there any real reason to put it in the same way? In other words, future replacement/maintenance would be facilitated if I had the cotter pin side by the shifter. The only downside I can see is, if the cotter pin fails, then the main pin could slide out, whereas that can't happen with the cotter pin on the "bottom". That seems pretty unlikely to me though. Yes you can simply take the shift lever off if need be. Some manufactures put a small dot on the shift shaft and lever so you can get it in the exact location upon reassembly. Sometimes I use a black paint pen if needed. Just snug the bolt tight, don't over think it. You should definitely put the pin back in the way it came out. That's a potential safety issue. Like you said, if the cotter pin broke, the pin would slide out and you'd loose a peg. Cool, that was pretty easy. I don't have a paint pen so I just used my mustard-colored linear graphite delivery device to mark a spot. I feel like I can usually figure some stuff out but I know there's a lot I don't know, eg if disconnecting the shift lever is simple or not, so the help is very much appreciated. Turned an easy job back into an easy job, and got my new footpegs installed. Nothing fancy, just some Emgo's from Amazon. Rubber was done on my old ones. Quick Reply: Noob question - how to remove/replace footpegs?